Another day, another MacBook Air screen repair! Fixing these thin Mac laptops has become our specialty. This 13 inch Air was brought in by a customer on behalf of his daughter. Kids love these light and portable laptops, but they are fragile! 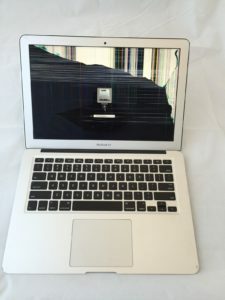 There is a large crack diagonally across the screen, with vertical and horizontal colored lines and part of the screen is black. These are all classic symptoms of a damaged LCD panel. The rest of the laptop was perfectly fine and should have a long life of homework and games ahead of it.